Lodi is situated in an area populated quite heavily by people of the Amish and Mennonite faith. Ever since I can remember it was a common occurrence to pass a horse and buggy on the country highways around Lodi. In recent years there has been an influx of even more Amish and Mennonite families to the area and so the chances are very good that you will need to make a wide pass around a buggy carrying a couple, sometimes with curious little ones peering out the back window, their young faces framed by the traditional bob haircut and black-banded straw hat. This increase in the Amish population of our area has meant nothing but a boon to local food and gardening aficionados. 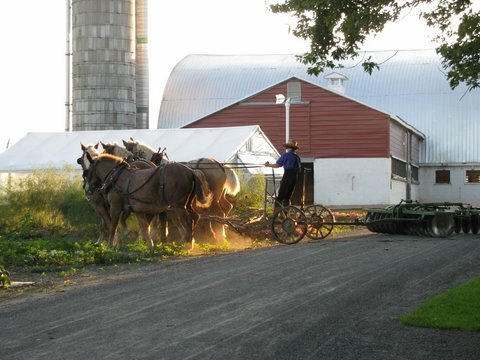 Among many different kinds of businesses that serve the Amish and non-Amish populations there are several excellent produce sellers that grow a lot of their own fruits and vegetables in greenhouses powered without use of electricity. We’ve been buying fresh produce from our local Amish produce stand for many years but last year we also relied on them heavily for the plants that started our garden. In addition to having excellent quality produce and plants their prices are often the most reasonable you’ll find in comparison to grocery stores and farmers markets. Last year we were thrilled when our garden tomato patch was spared the blight that was sweeping the countryside. Many of our friends and neighbors had their tomatoes wiped out completely but our tomatoes were blissfully unaware of any of that nasty blight business. The story we heard was that the blight affected plants that went through the industrial food chain and were purchased at places like grocery stores and Wal-Marts. Since ours came from small independent greenhouses we were in the clear and enjoyed many pounds of tomatoes. 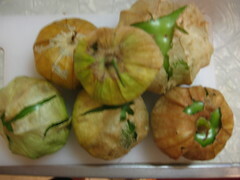 (It actually wasn’t the best year for tomatoes blight or no blight, but that’s beside the point). The population of Amish fits the rural farming landscape perfectly. Teams of six to eight Clydesdale horses farm on properties adjacent to those farmed by the most technologically advanced farming equipment. Seeing them at work in the fields gives us a glimpse at how perhaps our ancestors lived on and worked this land.